The Chhabra Osteopathy "6 Step Treatment Formula"
At Chhabra Osteopathy we use touch, physical manipulation, stretching and massage techniques to increase the mobility of joints, relieve muscular tension, enhance the blood and nerve supply to tissues, and to help a person’s own healing mechanisms. Osteopaths often provide advice on posture and exercise to aid recovery, promote health and prevent symptoms from reoccurring. 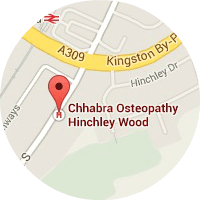 Chhabra Osteopathy has developed the The Chhabra Osteopathy “6 Step Treatment Formula” to give all our clients peace of mind and understanding to the treatment they will receive from us. To find out about your complaint and background medical history to ensure that treatmtment is appropriate and safe. The physical examination aids in determining the correct diagnosis and devising the treatment plan. Formulations are used to communicate a hypothesis and provide framework to developing the most suitable treatment approach. The treatment itself may involve stretching, massage, manipulation, ultrasound. Advice and self-help exercises to be performed at home. Follow-up appointment to moniter progress and suggest further help.